For urban metabolism researchers, obtaining data is one of the most important and time-consuming activities. This not only limits research activities, but it also creates a significant threshold for policy makers and others interested in using urban metabolism on a more practical level. The inconsistency and scattered nature of data furthermore complicate the uptake of urban metabolism tools and practices. Metabolism of Cities launches a new project called MultipliCity to try and take on this challenge. MultipliCity aims to develop a global network that maintains an online hub to centralize, visualize, and present datasets related to urban resource use and requirements. A network of local volunteers (students, researchers, city officials, citizens, etc) assists with the identification of relevant datasets, and the Multiplicity platform takes care of indexing, processing, and standardizing the datasets. This allows for a large collection of in-depth data to become available to researchers and the general public, vastly improving access and allowing for more work to be done on analysis and interpretation, rather than on data collection. Multiplicity is being developed by Metabolism of Cities, an online, open source platform around the topic of urban metabolism. Using past experience and already identified datasets, the following baseline themes have been provisionally identified to house the different datasets: 1) resources, 2) infrastructure, 3) mobility, 4) population, 5) industry, 6) utilities, 7) research, 8) policies. 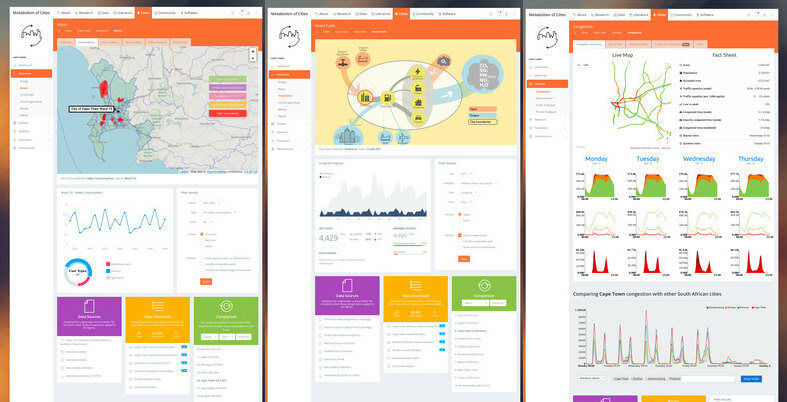 Multiplicity will create city profiles on a large number of cities and present datasets within those different topics. For each data topic (e.g. water consumption, electricity use, road construction) one or several common formats will be identified. Datasets will be collected and the raw data will be indexed (including the original spreadsheets and metadata including data quality indicators). Scripts will be written to process the raw data to the common format. These scripts will be made available as part of the meta data. The processed data will be uploaded to a master database, together with data on the same topic from the other cities. Filtering tools: users an quickly and easily filter data by time period, type of data, geographical area, and other parameters. Interactive visualizations: data will be presented as bar/line charts, or other charts where appropriate, that users can interact with. These graphs will be part of the theme’s page within the city profile, so that users can immediately get an idea of the underlying data without having to download any information. Mapping tools: georeferenced data (especially data on micro-territorial unit scale) will be displayed on a map and can be clicked on and browsed with a few clicks. Download tools: multiple options exist for downloading data. Raw data, calculations, metadata, and the processed data can all be easily downloaded in different formats. Users can also filter or otherwise restrict or expand datasets before downloading them. Identifying and uploading raw data does not require specialized skills or academic knowledge. Rather, it requires knowledge of the local language and the ability to figure out the existing procedures at the city or country of choice when it comes to data access. For this reason Metabolism of Cities will actively create a global network of volunteers to assist with the collection of datasets. By doing so, the time-consuming work of identifying datasets will be divided amongst many local participants. Through Metabolism of Cities’ existing network and through active recruitment the network is expected to organically grow into a large and ever-changing group of people. Volunteers will be recruited through talks at local universities, contact with academics and city governments, and through collaborations with partner organizations. For each city a large list with possible datasets will be created (based on all the possible datasets previously indexed or identified at other cities). This list will be presented to the volunteers as one large “to do” list. The volunteers will be asked to find whatever dataset they think is available, while also inviting them to suggest other datasets missing in the list. Within MultipliCity, the achievements of each volunteer (the datasets they uploaded) will be publicly listed. For each city and for each volunteer a number of points will be calculated to display how much work was already done (based on the uploaded datasets), and how much still needs to be done. This will assist in creating a friendly competition between cities and volunteers. Metabolism of Cities invites anyone interested in collaborating to get in touch! We are keen to work with universities to involve students, or with cities to see if we can set up an institutional collaboration that assists data exchange. We also warmly welcome individuals who would like to put their own city on the map and contribute data to our project. If there are funding opportunities that could be available to assist the roll-out of this project then we also invite you to contact us to discuss this.